A popular and precise consultation, assessing strengths, analyzing attendance patterns and diagnosing growth inhibitors. 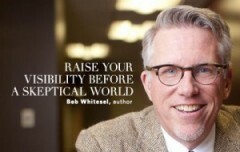 Dr. Whitesel will personally present an in-depth analysis and suggestions. Then he will work alongside you to develop a workable growth plan. Your Community’s Social, Economic, Ethnic and Receptivity factors. Group 2: Newer members (attendees), e.g. those who have started attending in the last three years. Group 3: Members of volunteers who have become less involved in the church over the last three years. Group 5: Focus group of your choosing. However, the above focus groups are customizable to your needs and situation. In addition, Dr. Whitesel will meet with the pastor and any senior leaders for a debriefing after the focus group meetings. “The 7 Systems of a Growing Church.” Here you will see your congregational scores in areas you are doing well and areas we will work together to improve. This applies insights from the largest survey of healthy churches in America: The American Congregations Study. “The 8 Steps to Church Change.” Here we will apply Kotter’s research-proven 8-step process to improve any of the areas we identify as in need of change or improvement. Attendees will participate by forming short-term “task forces” to each look at one of the areas that needs to change. This creates input from your congregation and its leaders. Meet with any leaders/congregants that want more input or assistance. Keep the process moving forward so real change takes place. Liturgical/order of service and flow, etc. Cost: $5.800 (2 years) or $4,800 (1 year) … our fee structure is 1/2 to 1/3 the fee most church growth consultants charge. Fee Support (reduced cost based on need and or church size, e.g. sliding scale), just ask. 2-year rate: $5800 = $1600 (initial payment) + $175 a mo. for 24 months. 1-year rate: $4800 = $600 (initial payment) + $350 a mo. for 12 months. Bob Whitesel D.Min., Ph.D. and his colleague Mark DeYmaz D.Min. are regarded as the nation’s leading experts on transitioning churches into healthy multi-cultural congregations. They have authored the definitive book on this process published by Abingdon Press and titled: re:MIX: Transitioning Your Church to Living Color (2016). In addition, Dr. Whitesel is the founder of the leading academic network for the study of healthy multicultural churches, titled The Academy of Intercultural Church Research. This consultation with Dr. Whitesel develops a planning process for a church that is wrestling with the implications of change in order to reach multiple cultures in growth and harmony. Each culture’s concerns and opinions. Basis of cultural conflict and unity strategies. How to create growth with several cultural groups at the same time. How to foster greater unity during growth. Strategies and programs that will work in your specific situations to reach and unite multiple cultures. Balance the cultural make-up in you planning. Unite multiple cultures under one roof and one leadership. Plan and evaluate changing cultural needs. Employ healthy and realistic growth projections. Broaden the church membership base. Increase the church’s community impact. “The 7 Marks of a Growing Church.” Here you will see your congregational scores in areas you are doing well and areas we will work together to improve. This applies insights from the largest survey of healthy churches in America: The American Congregations Study. Fee Support (reduced cost based on need). This diagnostic is required when conflict has created an impasse so that attendance is declining. Careful mediation built upon the strengths of your members leads to a mutually agreeable growth plan. This consultation also includes an in-depth 50+ page document of analysis and suggestions, and in addition Dr. Whitesel will work with you to develop a workable 10-Year Growth Plan. This develops a 10-Year Planning process for a church that is wrestling with the implications of change in order to reach younger generations. Dr. Whitesel is a leading expert in the field of growing the “multiple generation church” where three (3) generations can peacefully co-exist under one roof, one name and one senior pastor. Dubbed “THE MULTI-GENERATIONAL CHURCH” or “MULTI-GEN CHURCH” (for short) his strategies have revolutionized the process of keeping older churches healthy without alienating the older members of the congregation. Highly recommended! Strategies and programs that will work in your situation to reach younger generations. Develop three healthy generations under one roof and one leadership. This develops a 10-Year Realistic Growth Plan for a church that growing and trying to meet the needs of an expanding flock while simultaneously planning for the future. Dr. Whitesel will bring: planning insights, examples of what is working in similar-sized congregations around the nation, and precise planning tools; relieving you of much of the work, investigation, and worry over the best (for you) growth strategies to pursue. Strategies and programs that will work in your situation to maintain health while growing. Forecasting of the programs and ministries necessary for each stage of growth. .
As well as past growth rates. A broadened church’s strategy with sustained ministry and outreach. Cost: $6.800 (2 years) or $5,200 (1 year) … Our fee structure is 1/2 to 1/3 the fee most church growth consultants charge.